This is the first time using Franklin-Christoph ink. First time using S.I.G. nib. The nib is very nice. Smooth. I love getting variation in line from very fine to medium just by tilting the angle of the pen. For all intents, it’s a good fine nib. It’s not practical to be changing the angle all the time but OK for on the fly line variation. This ink is great. I love the colour. It’s not a bright purple but somewhat dark and moody. OK. So the stuff above the curlecue was done at the beginning of month. This is now. So obviously the colour fades with time or or the ink in the pen has evaporated. How do I describe this purple? Plum? This ink is just right. Not too wet, not too dry. It’s great with this nib. 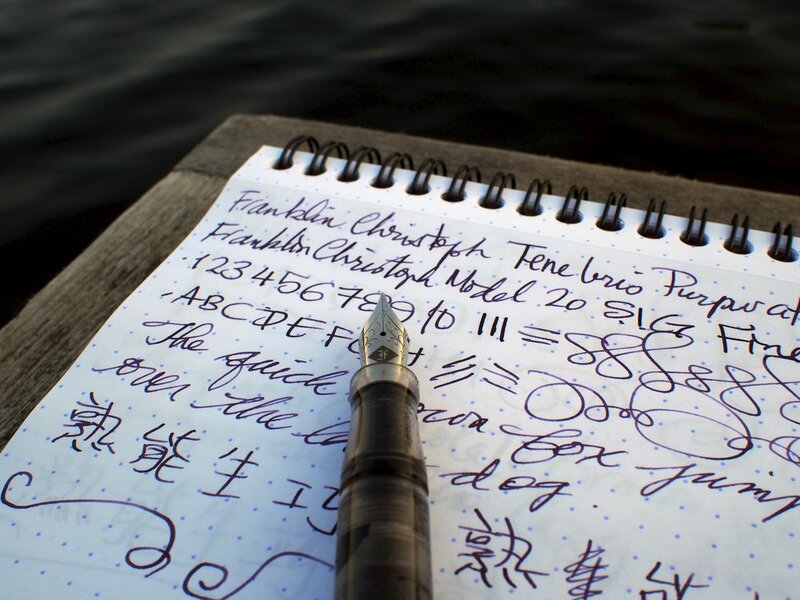 I wonder if the nibs were tuned to the ink or ink designed to work with Franklin-Christoph nibs. At any rate, it’s perfect. Looking back on the handwritten review, FC Tenebris Purpuratum is is rich and has nice shading despite it being quite dark. I like that it’s dark. I’m thinking it would be quite nice for December for card writing.